If you didn’t hear the rendition of the Alaska Flag Song by a Japanese choral ensemble last week at Anchorage’s Alaska Performing Arts Center, you missed something special. The finale of the musical play, “Samurai Musher” brought the audience to its feet to sing along with the cast. The play told the story of Japanese musher Jujiro Wada, and although the curtain has come down on the play, Wada’s story is still unfolding. 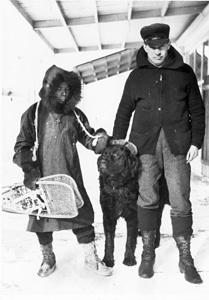 Wada with dog team in Dawson, YT. As the audience filed out of the theater, O’Hare, from Modesto, California, tells how she found out that her great, great grandpa was not only a famous Arctic adventurer in his day, but that he was Japanese. “And I didn’t believe it at first, but then, super-stoked afterwards,” she said. O’Hare says neither she nor her family knew of their connection to Wada, until about 10 years ago, when a cousin, Rick Medeiros, did some research. “Well I was told the story, and I got a hold of people in Japan and a hold of people in Alaska, the Yukon and a couple of other states, Louisiana,” Medeiros said. Medeiros, from Lodi, California, and a great grandson of Wada, is considered something of the family historian. He located the Japanese author of a book about Wada, which had been translated into English by a Yukon historian. That research revealed the family link that had been buried for almost a century. Wada and a man believed to be Captain Norwood, captain ot the Balaena, the vessel that Wada worked aboard for three years. 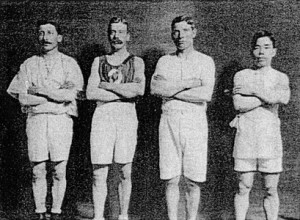 Wada mushed marathon distances, and ran marathons too, for cash prizes – one scene in the play takes place in 1907 in Nome’s new arena. The play, in brief vignettes, tells of the ups and downs of Wada’s life, from his first trip as a stowaway from Japan to San Francisco, and his rise to prominence in a pre-Territory Alaska as a dog driver renowned for his courage and skill. Musher Wada’s exploits were followed in newspapers of the time. He was even commissioned to blaze a trail from Seward to the Iditarod gold fields, and reporters went along to record his progress. 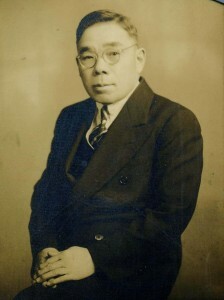 But at one point, just before World War I, he was falsely accused of being a Japanese spy, and faced discrimination as a result. The accusations ruined his reputation in the new Alaska Territory. Wada went to work in Canada’s North, living on Hershel Island off the Yukon’s Beaufort Sea coast. It is said that he mushed dogs as far as Winnipeg. He married into an Inupiat family and had a daughter, Himeko. But eventually he went back to California, where he died in 1937. Wada in his marathon days. He won indoor marathons, winning $500 in the 1907 Nome race. Somewhere down the decades, Wada’s story was lost to Americans. But through the efforts of a Japanese society that memorializes his name, and Alaska and Yukon historians, Wada is finally getting his due in the land of the midnight sun. O’Hare, Medeiros and several other family members from Japan and California were special guests at the Alaska performances of “Samurai Musher.” and traveled with the cast. Fifteen year old Ginse Wada, another great, great grandson, carried a framed picture of Setsu, Jujiro Wada’s beloved mother, to the theater for the performance. It took four years of planning to get them all together in Alaska, Medeiros said. O’Hare says since her trip to Japan nine years ago, the distant relatives stay close. The play was presented in Seward, Anchorage and Fairbanks during late April and May. 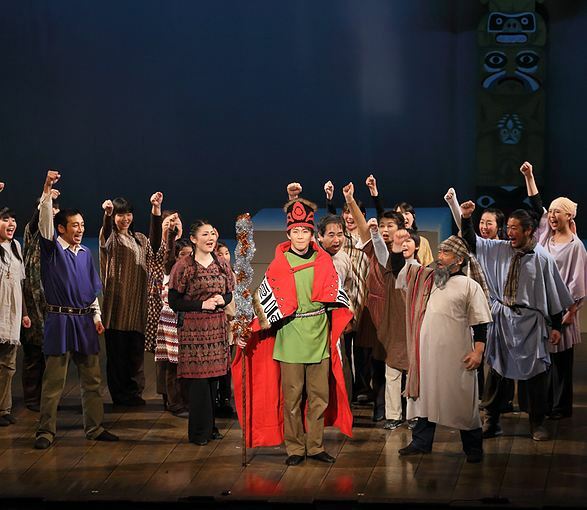 The musical was brought to Alaska by the efforts of the Jujiro Wada Memorial Society in Japan and the Asian Alaskan Cultural Center in Anchorage.